POKHARA, Oct 08: In order to promote the Mustang district direct bus service has been started from Pokhara to Mustang. Myagdi Korala Transportation Pvt. Ltd has launched a comfortable 27 seated bus from 4th October from Pokhara to Muktinath of Mustang to promote Mustang as religious place. The bus is well facilitated and consists of heater and cooler as well. According to the Manager of the bus, Naresh Rokaya, 30 million rupees has been invested to operate 5 buses and within few weeks of operation, again 6 buses will be added. He also has plans to operate in the route with super deluxe service bus. 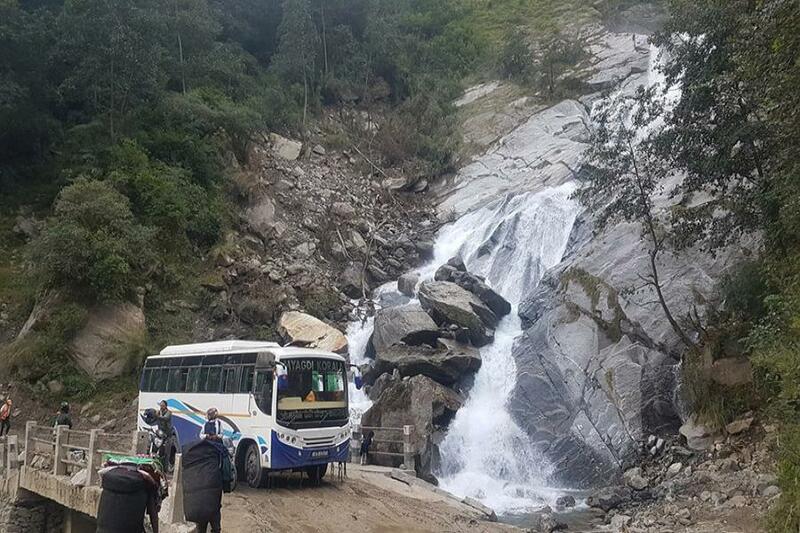 The passengers of the bus have to pay 1,100 rupees to travel from Pokhara- Mustang. Other facilities such as coffee, snack, cold drinks are also included in the fare. Including Rokaya, Prakash poudel, Narendra K.C, Dhan Kumar Pun, Suraj K.C, Mohan K.C, and Arjun Acharya have invested to operate this bus service. Parliamentarian of Gandaki State, Rajiv Pahari said that they have already separated budget for the construction of fast track from Korla – Mustang.” All the youths should be involved in income generating occupations then only we can develop our society,” he added.